Exciting musical, with slick script, 9 excellent songs and stylish incidental music. An engaging and meaningful experience for juniors and young teens. A generous-spirited, heart-warming musical that touches performers and audiences alike, leaving everyone encouraged! 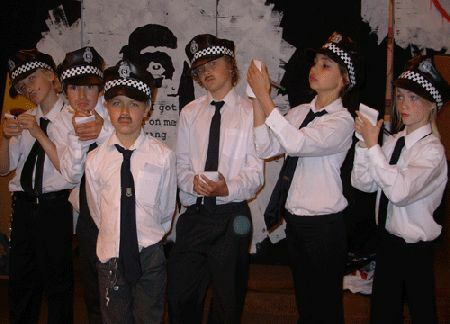 Young performers find the plot engaging and relevant, and can easily identify with the characters. 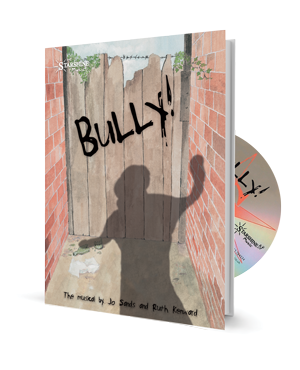 Drama is a safe way in which to explore sensitive social issues, and 'Bully!' is not only a great show, it's also highly recommended as a learning experience. Kim is the boss of an aggressive girl gang, and one of their victims is a boy called Jake. When one of Kim's gang, Ellie, steals his phone, Jake is afraid to go home and face his mum. He runs away, helped by his friend Danny. It's only later that Danny discovers it's Kim - his own sister! - who is Jake's tormentor! When Danny confronts Kim, she tries to excuse herself by explaining that she has been bullied in the past. Danny isn't impressed. 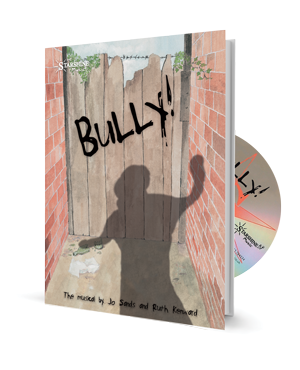 But Kim's gang back her up, saying they need the gang to feel strong because they too have experienced being bullied, Jake begins to make a general connection - people who are victimised may later become bullies. Ellie is shamed into giving Jake's phone back. He asks why she took it, and we find out that her big sister Rachel is horrible to her: which Jake sees as confirming the pattern of victims becoming bullies. This emboldens him to suggest that Ellie's bullying sister must be a victim too! Jake, Danny and Kim all go with Ellie to confront her sister - but are shocked to discover that Rachel has never actually been bullied - which ruins their theory! So what turned her into a bully? Rachel suddenly reveals her loneliness. Ellie is generous enough to forgive her, and all ends well now that everyone has begun to open up and understand each other! "Young performers love this musical! They love its modernity, they love the characters, the show means something to them and its cathartic effect cannot go unnoticed! The message got across really well. There's a real anti-bullying buzz around the school." ~ M Cooney, Music Teacher, Ireland. The Director's Pack includes a copy of the book on which it is based, which makes an excellent souvenir for children taking part. Additional copies may be ordered below. 'Bully!' is also available in Kindle Edition. Young performers love this musical! They love its modernity, they love the characters, the show means something to them and its cathartic effect cannot go un-noticed! The message got across really well. There's a real anti-bullying buzz around the school. 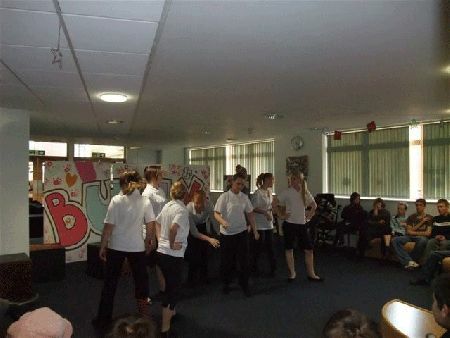 We performed 'Bully' in March. Like the other Starshine musicals we have performed it is outstanding! The most amazing experience for us all. Great fun, catchy songs and fun script that was easily understood. Easy to stage. Message received loud and clear by all age groups. Friendships formed that will last a long time. 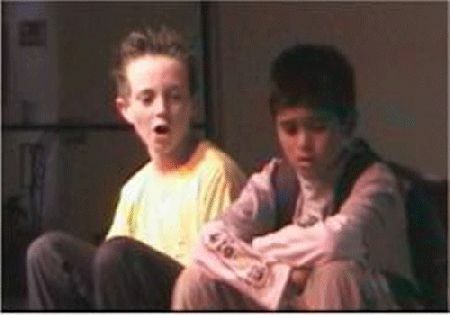 Memories are made by musicals like this. Wish we could do it again and again. We loved Bully! The music was catchy and the message highly relevant. It was the best musical I have seen primary students perform...ever! I love this play and I wish it would never end as I am doing this in school. We are having sooo much fun doing this and I recomend this play to every one. I am playing Amy-police oficer. We have just performed your musical 'Bully!'. It was a raging success. It is such a great show! A Fantastic Show With Delightful Songs! 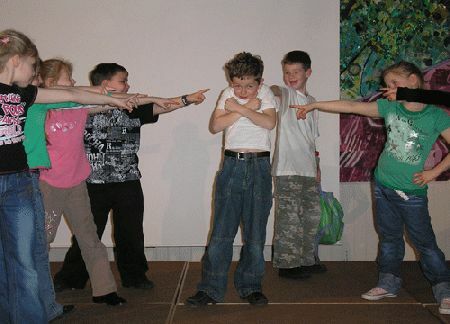 This show was a delight to teach and the children had amazing fun! An excellent play! Review by Karen Roberts - Music Teacher, Doncaster. 'Bully!' - what an excellent resource for Year 6!! Energy charged rock songs, superb backing tracks, and a plot which is so close to the experiences of our children! Our best show ever! Wonderful Show With Excellent Songs. Review by Elizabeth Maclaren - Teacher, Glasgow. Dear Starshine. Could I take this opportunity to say this was a wonderful show with excellent songs which were well within the performing capacity of our Primary 6 and Primary 7 children. 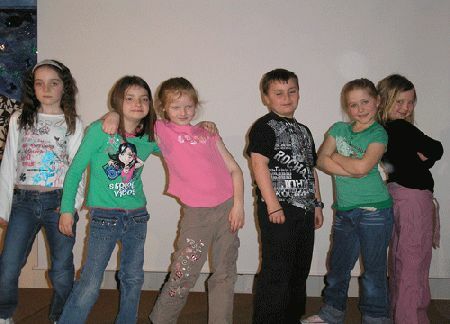 The children themselves have thoroughly enjoyed learning the main aspects of musical theatre, and the settings and situation are close to every child's heart. Young Performers Love This Musical! Review by Christine Andersen - Teacher, Sussex. Very good! Songs are catchy with a good variety of moods and styles. The characters are well drawn and genuine - easily identifiable with the children. The children liked the upbeat tempos and brilliant backing tracks. The Children Really Enjoyed The Challenge. The children really enjoyed the challenge, there are roles for every child and there are plenty of opportunities to create dance routines to accompany the songs. 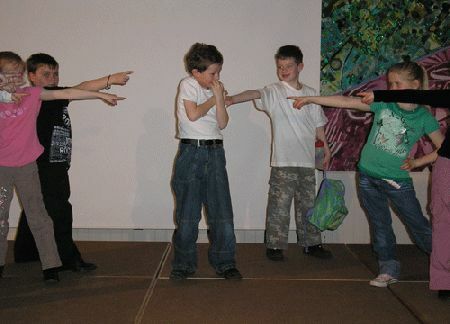 The rehearsals helped build relationships and gave children the chance to see each other in another light; performing Bully saw lots of the children come out of their shells and enabled them to shine. 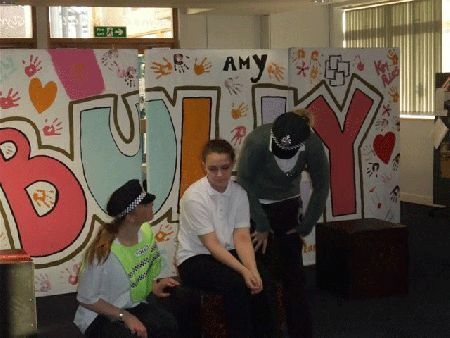 Our tour of 'Bully!' went very well. 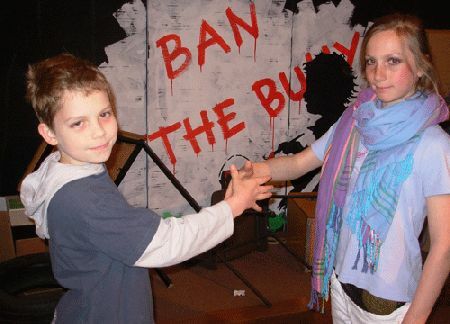 All of our audiences enjoyed themselves and our actors got a great deal out of the experience. Dear Starshine - Thank you! Thank you! Thank you! Your wonderful rock show 'Bully!' 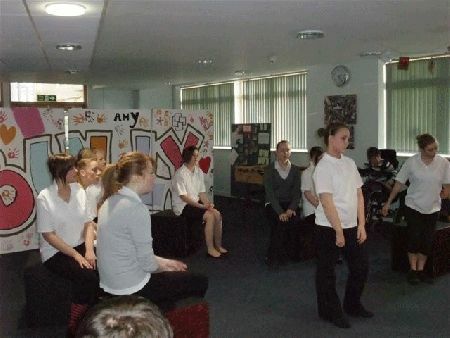 really captivated audience, staff and pupils alike and lent our small school a momentary glimpse of a London Musical! Rehearsals were fun, and the students (yrs. 7 & 8) danced to the music and experimented with, for them, somewhat alien aggession to rise to the challenges of the script. We were lucky to have a strong choral element which lifted the brilliant songs to good performance levels, powerful whole gang threats when needed and tender or sad poignant melodies at other times. The music and the script were inspiring. It was definitely our best show for teenagers to date. Fantastic! What's next? Review by Melanie Gray - Teacher & Music Coordinator - Wiltshire. The setting of words to music and creating atmosphere delivers a message in a way that is easier to take on board. 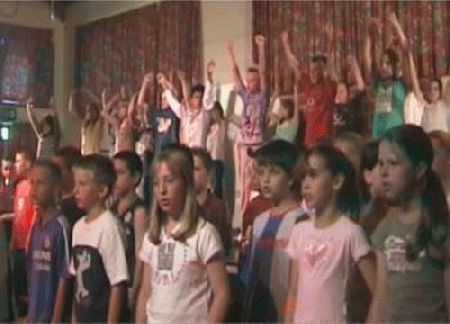 The best moment was getting the children (age 6 to 11) singing in 2 part harmony for the first time - a real spine tingling moment! Review by Wendy Maude - Parent, East Sussex. Just a note of appreciation for two fabulous musicals. We had a double bill of Panto Pandemonium and Bully! and I have to say the feedback from the audience was unbelievable. 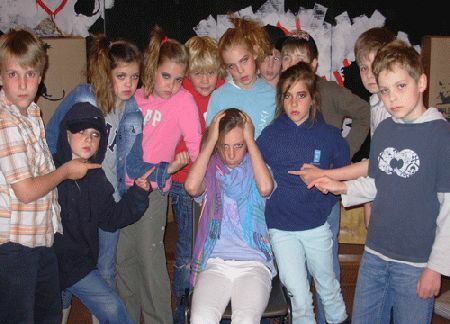 I have been working with children staging plays for a number of years I'm really feeling this year's performance will be hard to beat. Best of all is the enthusiasm of the performers already asking "What play are we doing next year" and this worries me 'cos i'm not sure there's anything else out there that will allow us reach the high standards we attained this year - all thanks to these two wonderfully thought out plays.